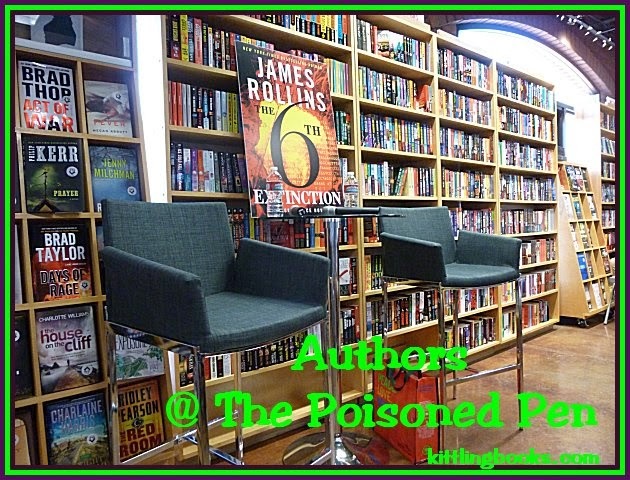 Mette Ivie Harrison at The Poisoned Pen! One of the first things Denis and I were told was that the author's plane was delayed, so the event would be starting a little late. Since we always come prepared, this didn't bother us. We settled in to enjoy our books, and when 7 PM rolled around, our group was entertained by host and bookstore owner Barbara Peters, who told us of her recent trip to South Africa. Among other things, she told us the real reason for Cecil Rhodes funding the Rhodes Scholarship ("How depressing! "); she recommended James Michener's The Covenant and Michael Stanley's Deadly Harvest (both excellent books! ); and that she waded out to where the Atlantic and Indian Oceans meet and discovered that there was a 30-40° difference in water temperature. 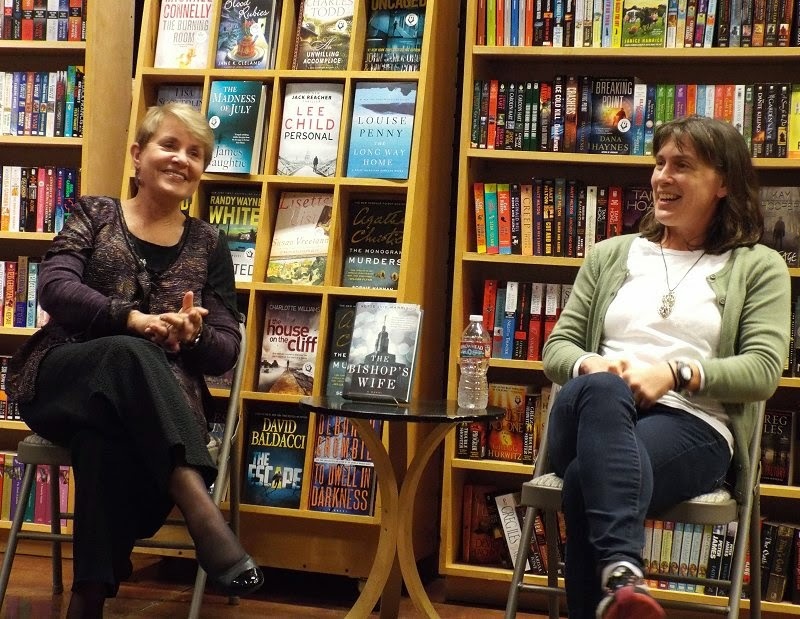 She'd just begun telling us of upcoming events and the Writer in Residence program beginning on February 21 when the evening's guest, author Mette Ivie Harrison, arrived-- looking a bit frazzled from her airline experience. "Linda is the type of woman I want to be." After apologizing for events beyond her control, Mette immediately began telling us a bit about herself. She is a practicing Mormon whose sixth child, a little girl, was stillborn. As a result all the ensuing trauma, Mette lost faith in God and in her church. She began researching the history of her church, calling herself an "anthropologist of Mormonism" who began to see her fellow Mormons as a "tribe." "The main character of my book, Linda Wallheim, is the type of woman I want to be," Mette told us. "Linda is the sort of woman I can believe in, and it didn't take me long to realize that I wrote The Bishop's Wife as a way to get back in the church." At this point, Barbara asked her if this was the first book she's written. Mette told us that she has written and published seven children's books, but that this was her first adult novel. In the first draft of Mette's book, Linda didn't lose a child, but her editor told her, "We don't understand why Linda is so passionate about women and why she is so drawn to young girls." Seeing that Juliet was right, Mette decided that art would imitate life. Linda loses a daughter and thus gains a reason to get involved and solve these crimes. 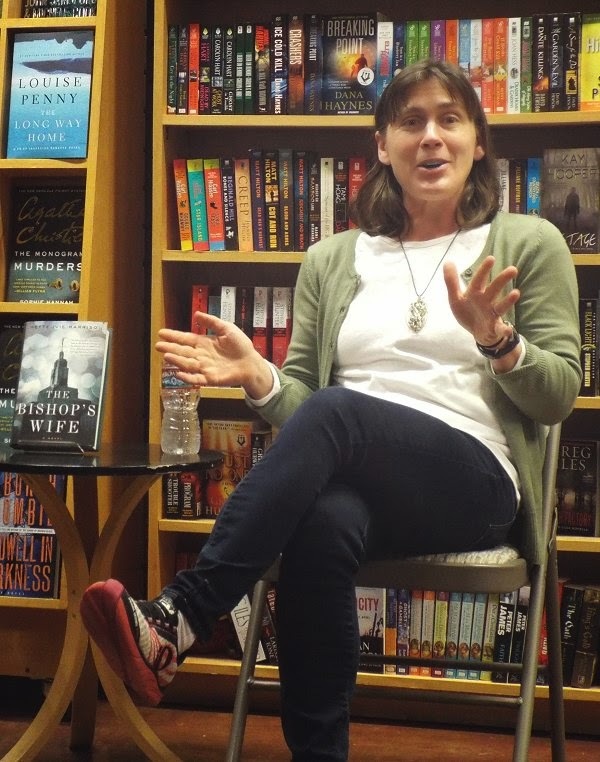 "The Bishop's Wife is loosely based on a real life murder case-- the Josh and Susan Powell case-- that occurred in Utah. It transpired over several years and has a terrible ending that I did not use in the book, but it made me wonder in what ways Mormonism might have contributed to this case-- the Mormon patriarchy, the Mormon views on eternal marriage...."
"How does the bishop react to his wife's involvement in the case?" Barbara asked. "I used my own husband as a template for Linda's husband Kurt. Kurt is used to Linda having a strong voice in matters, but her insistence on getting involved does put a strain on their marriage, and that will continue to play out over the nine books I have planned for this series," Mette replied. "That was going to be my next question," Barbara said with a smile. Mette then told us that yes, she does have nine books planned for this series. The first two take place in Draper, Utah... and then she had to take the Jessica Fletcher/Cabot Cove Syndrome into account, so all Linda's sons begin asking her for help. When Barbara asked her if there was a specific reason for the length of the series, Mette nodded. A Mormon bishop serves for five years. The last book will be set when Kurt is released as bishop, and it will be a traumatic time for them both. Linda finds herself at a crossroads when all her sons have grown and the last one is about to leave the nest. She wonders if she should get a job, but she decides to remain a good mother. It's her mothering instinct that continuously gets Linda into trouble. We then asked Mette about her background. Mette, her parents, and her ten siblings lived in New Jersey until Mette was ten, when the family moved to Utah. (Her parents, who now have seventy grandchildren, live in Illinois.) Mette wanted to be a writer from the age of five, but her very practical parents told her, "Writing is a nice hobby, but you need to get a real job." What did Mette do? She went to graduate school at Princeton and earned her PhD in Germanic Languages and Literature. She and her husband were high school sweethearts who met while they were on the swim team. He is a systems engineer specializing in robotics. 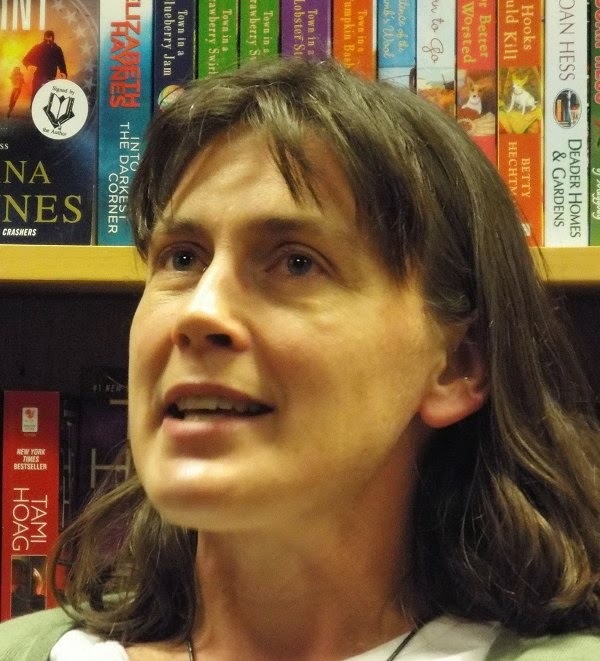 When asked, Harrison admitted that she did have two different talks depending on whether her audience was Mormon or non-Mormon and that reviews of her book were often divided along the same lines. And things are also changing a bit with her children's books. One of her publishers wanted Mette's next book to be a "children's fantasy," but she talked them into letting her write a young adult mystery set in an exclusive Princeton area prep school. For some reason, this evening seemed to fly by even faster than many previous ones had, and Denis and I had a lot to talk about on the way home. What an illuminating and entertaining evening! I'm looking forward to reading more of Mette's books about Linda Wallheim. Always happy when you share your trips to the PP, Cathy :-). And you've reminded me that I'd like to try The Bishop's Wife. 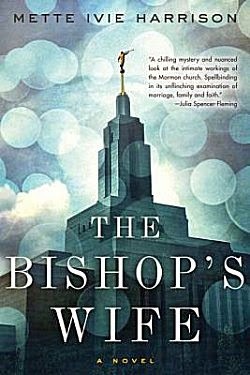 I have to admit that I was very pleased to learn that The Bishop's Wife is the beginning of a series because Linda Wallheim is a character I would enjoy learning more about. I've been on the fence about reading THE BISHOP'S WIFE, but I think I will need to try it. Sounds like a fun event! It was a fun event, Kay-- and I think you'd enjoy Harrison's book. Linda Wallheim is a fascinating character. I knew next to nothing about the Mormon faith till I read. This book. It was quite an introduction! It is, isn't it? I think Harrison did a very good job of telling us about the Mormon faith without burying us in too much detail.